The M30 Automatic Alarm Dialer is an Industrial Autodialer designed specifically for the harsh environments found in commercial situations. 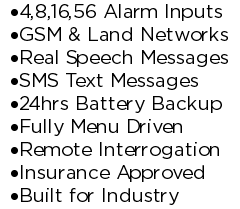 As an Alarm dialer designed for industry it comes with all the features you might expect, including; 4,8,16 & 56 alarm inputs, integrated and monitored battery backup, multiple alarm dial out lists and an IP56 enclosure – check out more Standard Features. 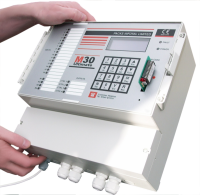 The M30 Automatic Alarm Dialer is used around the world by a large array of customers and in a variety of situations including; Horticulture and Livestock Protection, Building Management, Computer Room Protection, Power Generation, Equipoment & Process Monitoring, Power Failure, Temperature Monitoring, High/Low Water Levels, Intruder Protection, Lone Worker Protection plus many more…. The M30 is unique in that is can offer both PSTN and or GSM phone connections. This can work in 2 ways either a dedicated PSTN or GSM connection, or you can use the GSM as a backup, so if the M30 senses the connected land line has failed it will switch to the GSM backup line. Not only does the M30 provide a user recordable alarm voice message for each alarm input but it now offers SMS messaging as well. Each Alarm input can have its own unique SMS message so instead of a “channel 1 alarm” you can get a more useful “Power failure in Hanger 4”. SMS is very easy to use – when programming in your phone numbers you just need to select whether you want to send a SMS or Voice alarm message. The above is only a small subset of the available features on the M30 Automatic Alarm Dialer; for a complete list visit the Standard Features and Optional Features pages or contact us for a quote.